If you are interested in health administration, there are few things as interesting as the health care reform law signed earlier this year. As a resource designed to help those interested in learning more about the new law, and the options available right now, the U.S. government created Healthcare.gov. If you are interested in learning more about health care, and your options under the new law, there are plenty of resources. 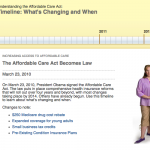 Timeline: What’s Changing and When: One of the most useful tools on the Healthcare.gov site is an interactive timeline that illustrates the changes that came with the health care reform law. This interactive timeline allows you to see what has already changed, and when other changes are being made. Perfect for those interested in what’s coming next. About the Law: Health policy wonks will appreciate this page, which connects you to the full text of the health care reform bill, and helps you keep track of the changes. Also contains a helpful chronology of when different changes will take effect. Perfect for those who want to be informed from the source, rather than getting second hand information. Provisions: You can get a straightforward look at the main provisions in the health reform bill. Offers a look at early retiree coverage, pre-existing conditions, and all of the other provisions in the bill. Easy to navigate, and takes you through each of the major issues. In Focus: If you are interested in more information about what is available for rural Americans, and learning more about health disparities, this resource is extremely educational. Find out more about what health care reform should do for specific groups of people. Additional Health Initiatives: Overall health is expected to get a boost from health care reform. This page is worth bookmarking, since it contains additional information Medicare, community health centers and electronic records. A great resource for those interested in learning more about how they can control their own health care. Families with Children: This great resource offers information for families with children so that they can see how the new law will affect them. A helpful and interesting resource designed to break down the new law in a way that is understandable. Implementation Center: Learn more about what you can do to help implement health care reform. Perfect for health administrators and public health officials. If you are interested in care issues and health insurance, you can get help sorting through everything on Healthcare.gov. Find Insurance Options: This tool will help you find the type of health insurance that is best for you. Put in information about your family and your current situation, as well as your state, and get help finding the best plan for you. Compare Care Quality: Get more information about care quality in different areas, and link to a tool that can help you compare hospital care at various institutions. A great way to determine the level of care you are likely to get in certain hospitals. Individuals with Health Conditions: Get helpful information geared toward those with health conditions. Learn what the new law will do for you, as well as explore your health insurance options. Learn more about what you can do now, before the new law completely takes effect. Pregnant Women: Interested in learning more about health care options for pregnant women? This resource is perfect for those who want to know about insurance requirements and coverage for pregnancy. Coverage of Young Adults under Age 26: If you are younger than 26, or if you have children under 26, it is important to understand your health insurance options under the new law. Includes a handy link to an informative fact sheet. Patient’s Bill of Rights: You have certain rights when it comes to health care and coverage. The new law offers a number of helpful items for you. You can use this resource to learn more about your care rights as a patient. A great consumer resource. Appealing Health Plan Decisions: If you are not happy with your health plan, and the coverage decisions, you can actually appeal. This resource helps you know exactly what you need to do if something is not right with your health insurance coverage. If you are looking for resources that can help you with healthy living, Healthcare.gov offers some great tools and informational resources. 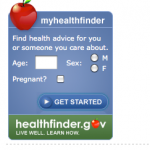 MyHealthFinder: You can link to this great tool from Healthcare.gov. It helps you assess your current state of health, and provides pointers and helpful hints on what you can do to improve your health. Preventative Care: Learn about the importance of preventative care to your health, as well as learn about what you can expect under health care reform in terms of improvements to your access to preventative care. HealthCare Notes: Learn more about what you can do to improve your health, as well as the health of those in your family. This resource offers helpful information on coverage, prevention and better living. Includes information on what you can do to help your kids live healthier. Webcasts and Videos: This resource offers you access to interesting videos and webcasts aimed at helping you learn more about healthy living, and how the health care reform law can help you achieve that goal. Engaging and interesting videos and webcasts about health issues that are important to you. Fact Sheets: Get access to definitive and authoritative information on health care reform, and the things you can do to improve your overall health and wellness. Includes fact sheets on what different racial groups can do, as well as what others can do. 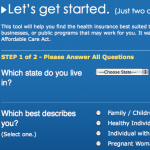 Also includes helpful information on state health exchanges and how they will affect you.